Dustin Kunnari, cured of brain cancer by Burzynski – then and now. Dustin Kunnari, cured of brain cancer over 20 years ago by Dr. Burzynski’s Antineoplastons. Refer to the sourced transcript for more on this part of the story, here. Learn more about the director of this documentary series, here. Jessica Ressel-Doeden was diagnosed with a diffuse, intrinsic, childhood brainstem glioma (DIPG) in March of 1996 at age eleven. [The Lancet 2006 explains grim outlook – “survival remains static”]. Considering that radiation treatment has never been shown to cure a single patient with her condition, combined with the devastating side effects such a treatment would inflict on an eleven-year old child—her parents declined the radiation treatment offered by her oncologists and decided to have Jessica treated by Dr. Burzynski instead. 1. Diagnosis: Jessica underwent an MRI on April 10, 1996 at the St. Louis Children’s Hospital which revealed a tumor in her brainstem. Her diagnosis was also confirmed on May 7, 1996 upon initial consultation with Dr. Burzynski. She had multiple MRIs after she was admitted into the Burzynski Clinic. 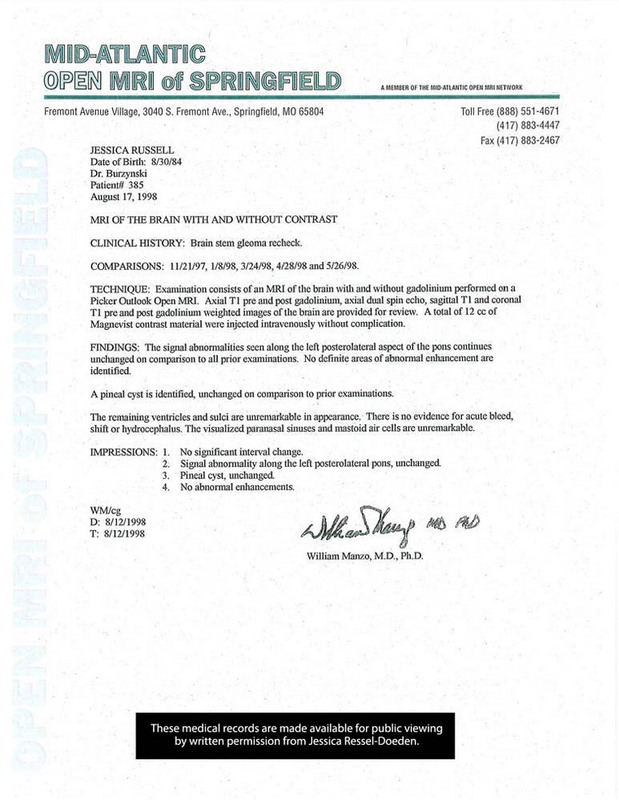 There is also multiple third-party confirmations of diagnosis by physicians from the Springfield Clinic and the Missouri Eye Institute demonstrated by letters written to the Ressel’s insurance company. 2. Recovery: On May 8, 1996, Jessica began antineoplaston treatment. Her tumor disappeared and reappeared multiple times throughout the course of 14 months after the start date of treatment. On June 27, 1997, her tumor disappeared permanently. She has had multiple MRIs of the brain since that time which have all been negative for tumor recurrence—with the last MRI being May 20, 2005. Read Jessica’s treatment summary here. Read Jessica’s tumor measurements here. 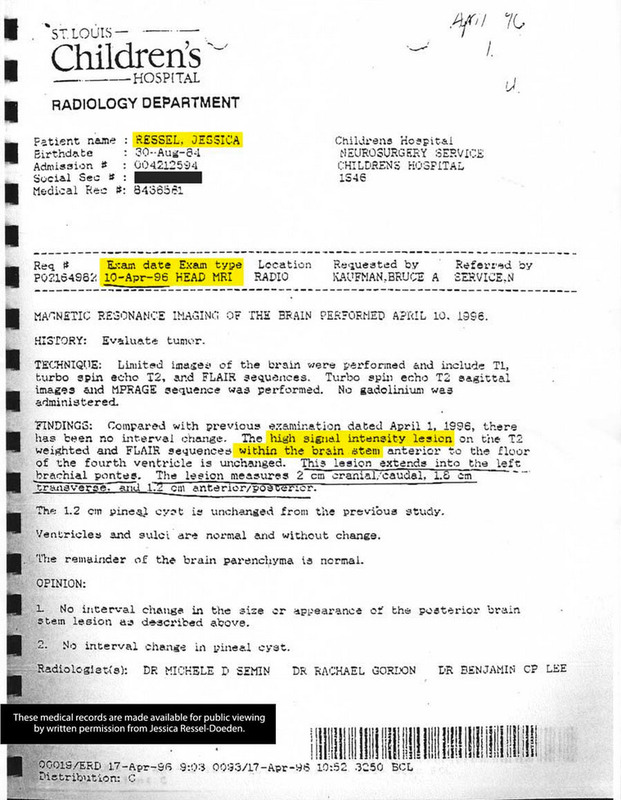 After her full recovery, the Mid-Atlantic Open MRI of Springfield, MO confirmed her tumor-free MRIs from 11/97 to 5/98 [PDF all medical records and sources for this paragraph]. 3. 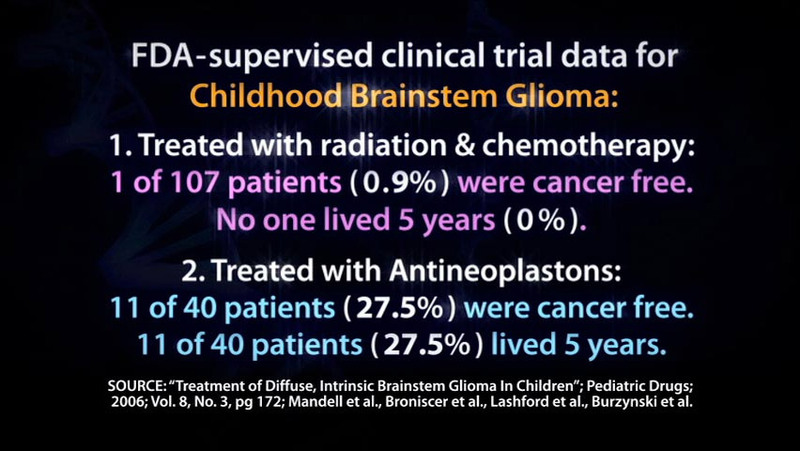 FDA-supervised clinical trial data comparing chemotherapy and radiation treatment to antineoplaston treatment in patients with diffuse, intrinsic, childhood brainstem glioma. It has been clearly demonstrated that of 107 patients treated with chemotherapy and radiation with this type of tumor: 0.9% of these patients were cancer-free at the end of treatment, with no patient surviving 5 years after diagnosis. Of the patients treated with antineoplastons with this type of tumor: 27.5% of them were cancer-free at the end of treatment, with 27.5% of the patients living at least 5 years after diagnosis. Therefore, Jessica Ressel’s recovery after being treated with antineoplastons is not a mere anecdotal case (See sources from start of this post above). Most would assume that such results would be front page news across the world, or would be grounds for Dr. Burzynski to receive the Nobel Prize in medicine. Sadly, these peer-reviewed results have been universally ignored by mainstream medicine. Unfortunately, most insurance companies will not cover antineoplaston treatment. The Ressel family had to come up with $6000 per month to pay for her treatment all by themselves. The high cost of antineoplaston treatment is directly due to the United States government’s refusal to allow any tax-payer money to be granted to fund the FDA-supervised clinical trials that Jessica participated in—while simultaneously granting PhRMA tens of millions of dollars to fund similar FDA-supervised clinical trials with inferior outcomes. During our interview with the Ressel family, Robin said that she “had called the Ronald McDonald House to see if we’d be able to stay there, because we were going to have to stay in Houston for a while, I was talking to a volunteer on the phone—when I mentioned we had an eleven-year old we were taking to see Dr. Burzynski and we needed a place to stay for a couple of weeks—you could hear whispering going on in the background, the volunteer was being prompted what to say, and The Ronald McDonald House refused to allow us to stay there because we weren’t an M.D. Anderson patient. I felt bad for the volunteer, you could tell she was being told what to say.” Dan followed up by saying “There are a lot of programs out there, but I will never give a dime to the Ronald McDonald House. We were in a desperate situation, and they refused us because we were a patient of Dr. Burzynski”. 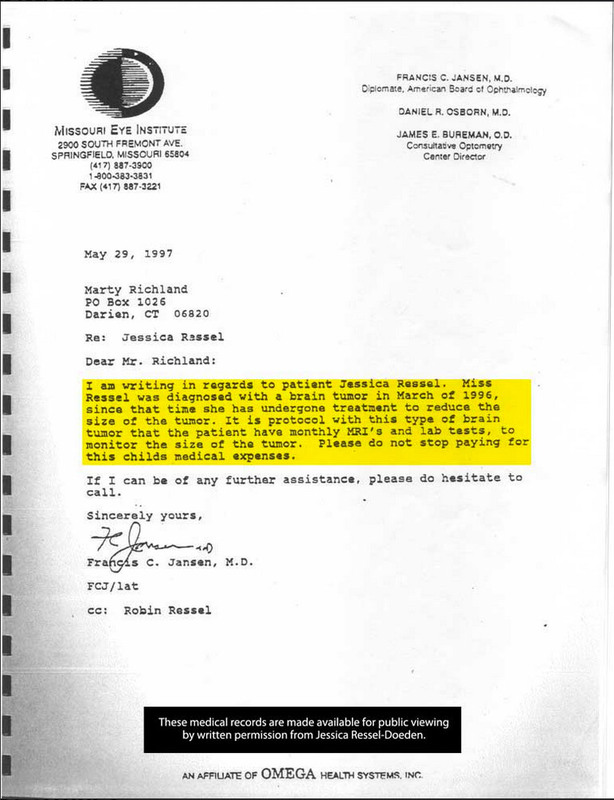 Jessica Ressel was being treated by Dr. Burzynski in 1996, several months after the FDA’s 5th grand jury against Dr. Burzynski resulted in an indictment. “The government was more frustrating than the cancer itself.” The Ressel family traveled to Washington DC to meet hundreds of other Burzynski patients to speak out against the FDA’s attempt to remove him from society. 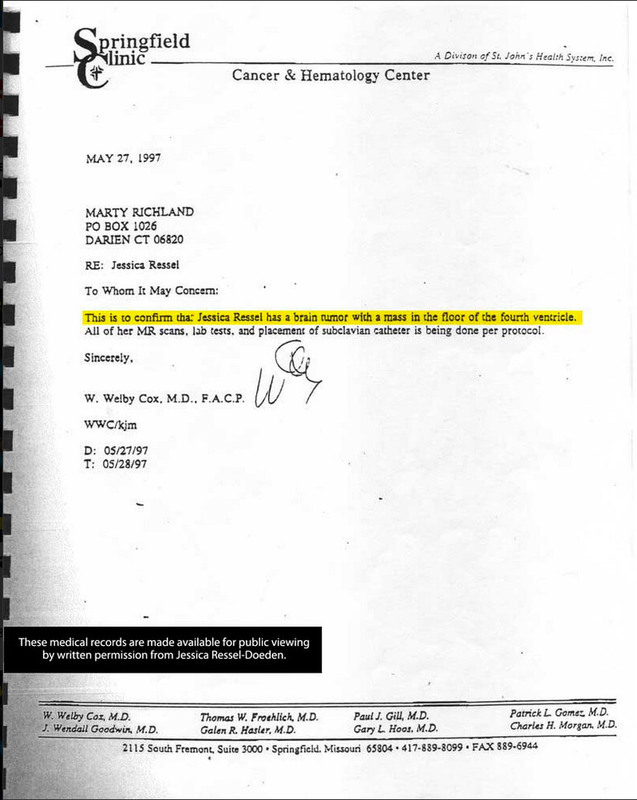 Jessica Ressel’s medical records are published by written authorization by Jessica Ressel-Doeden. The attempts to knock Burzynski out of business is like a game of “whack-a-mole” between state and federal agencies. For the time being the FDA is leaving Burzynski alone, but the Texas Medical Board (TMB) is trying to shut his clinic down once again. The Texas Medical Board can no longer go after Burzynski for using Antineoplastons, as they lost countless court cases against Burzynski, ending in the State Supreme Court. Now they have changed their tactics and going after him in other ways. This case, like the countless ones before it will be a loss for the TMB, but the TMBG isn’t interested in winning any of the cases, it is a way to attempt to drain Burzynski financially. Read the latest “complaint” against Burzynski here. Their lead prosecutor left the case for unknown reasons, postponing the case until November of this year. This is an interesting read from an independent moderator at “Dr. Social”, here. Sophia was born in January 1996. In December of 1996, Sophia’s parents noticed that she was having trouble with her motor skills, displaying a decrease in appetite, and had noticeable swelling of the head. After several visits to the pediatrician’s office, they decided to have an MRI conducted to see if anything was wrong with her brain. 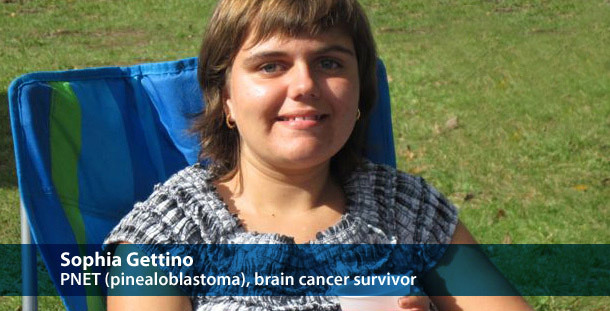 The MRI revealed a mass measuring nearly 3 cm in her brain. 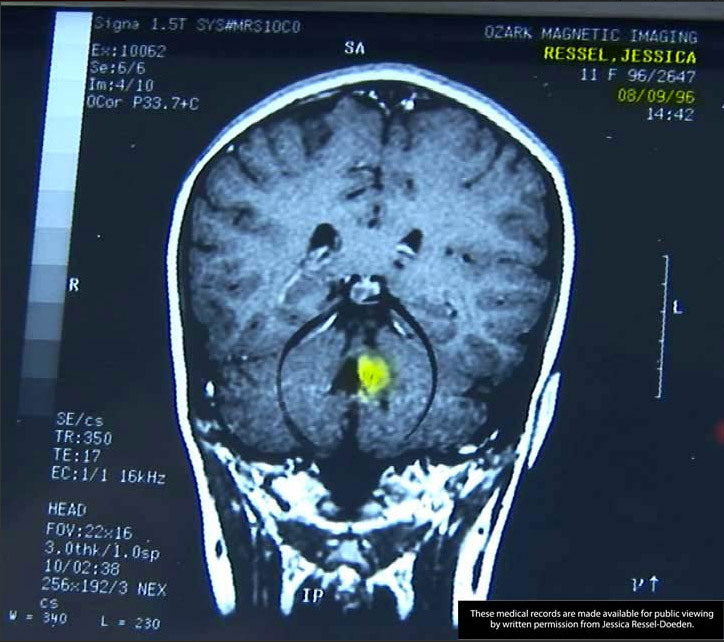 On December 18, 1996 a biopsy was performed by the pathology department at the Syracuse Health Center in Syracuse, New York—which diagnosed Sophia with a deadly pinealoblastoma brain tumor. On December 20, 1996 surgeons at the Syracuse Health Center removed nearly all of her tumor, but were unable to remove it all without injuring Sophia any further. The chemotherapy offered to Sophia was a combination of thiotepa, etoposide, and carboplatine. Thiotepa Chemotherapy was approved by the FDA on March 9, 1959. This drug was approved for breast, ovary, and bladder cancer primarily. To date, thiotepa’s “safety and effectiveness in pediatric patients have not been established.” The expected side effects of this chemotherapy in non-pediatric patients are: low blood cell count, vomiting, infertility, hair loss, blurred vision, and being a carcinogen causes more cancer. Etoposide Chemotherapy was approved by the FDA on November 11, 1983. This drug is used to treat people with testicular cancer or small cell lung cancer. In pediatric patients, etoposide’s “safety and efficacy have not been established”. The side effects in non-pediatric patients receiving this therapy include leukemia, nerve damage, inability to fight infections, and vomiting. There is limited evidence to verify whether or not this drug used alone causes more cancer, but there is sufficient evidence that when used with other chemotherapy that is does cause cancer. Carboplatine Chemotherapy was approved in the late 1980’s and is primarily used to treat ovarian, lung, and head and neck cancers. “the most troubling effects of carboplatin tends to be damage to the bone marrow…” Other side effects include damage to the nervous system, mouth sores, loss of appetite, stomach pain, diarrhea, vomiting, and changes in vision. After understanding that these chemotherapeutic drugs would not likely save Sophia, combined with the side effects this chemotherapy regimen could cause to their daughter, Sophia’s parents declined all chemotherapy treatment offered by their oncologists and decided to explore other methods of treatment. Upon this search for another option they found the Burzynski Clinic. 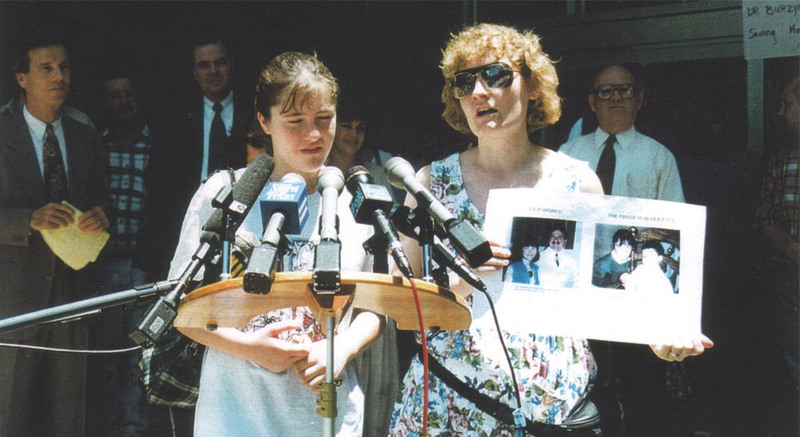 On February 27, 1997 Sophia was admitted for antineoplaston therapy in a FDA-supervised Phase II clinical trial. She discontinued antineoplaston therapy on March 7, 2003 due to a complete response. She is alive, healthy, and remains cancer-free today. (A residual, benign tumor is still left in her brain, but all signs of malignancy have disappeared and have not returned to date). 1. December 18, 1996 pathology report from Syracuse Health Center. 2. December 25, 1996 Syracuse Health oncology evaluation report verifying diagnosis, with suggested experimental chemotherapy regimen. 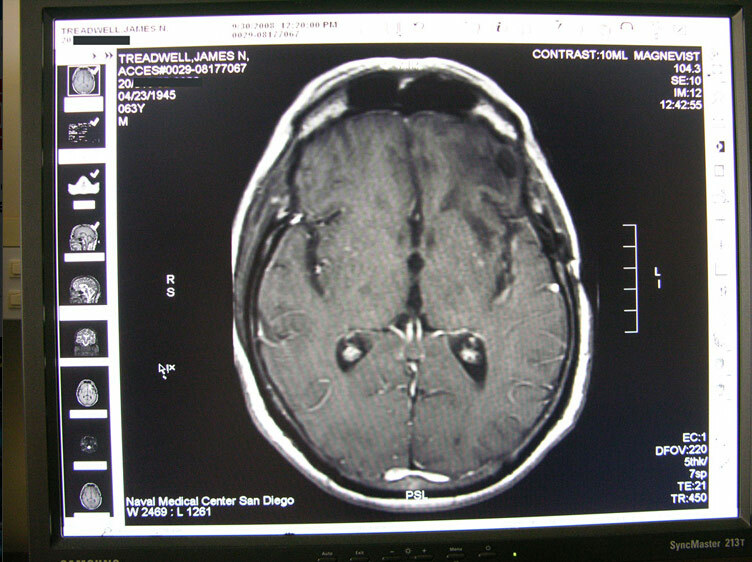 Baseline MRI of the brain on February 26, 1997 showing a massive tumor in her brain. 5. Tumor Measurements from start of treatment to declaration of “complete response”. 7. 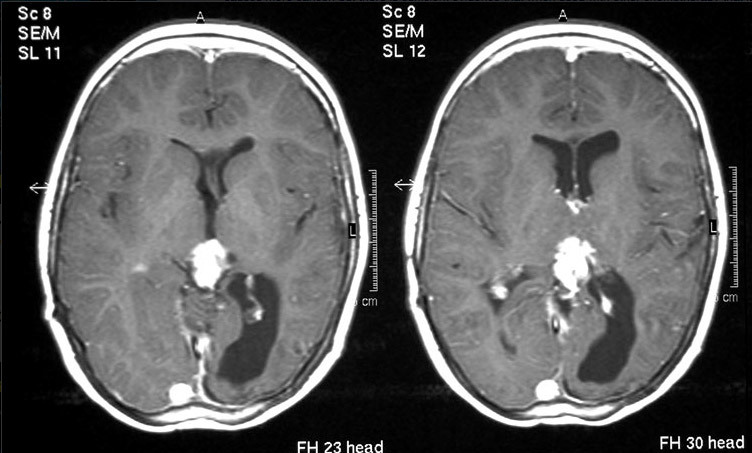 February 3, 2003 MRI scan showing the residual benign remnants of the once malignant tumor. In a group of Phase II clinical trials using only Antineoplastons, with 13 children ranging from one to eleven years old with PNET tumors: Six of those patients (46%) survived more than 5 years after treatment. Five of the six patients had not undergone any previous chemotherapy or radiation prior to being treated with Antineoplastons. Click here to read this study’s abstract. In contrast, a chemotherapy drug produced by GlaxoSmithKline called Topotecan (also a gene-targeted drug), is undergoing Phase II trials for this type of tumor in children as well. Twenty-six children were treated, two objective responses were noted (7.6%), and these two patients managed to live beyond five years. However, this does not indicate the damage, if any, this chemotherapeutic drug caused these patients. Click here to read this study. Therefore, in virtually identical Phase II gene-targeted clinical trials treating PNET in children: topotecan chemotherapy resulted in a 7.6% 5-year survival; while Antineoplastons resulted a 46% 5-year survival. It’s important to note that while Antineoplastons are free of harmful side effects, topotecan’s side effects generally include: hair loss, vomiting, and diarrhea—if you are lucky. If you are one that has a more severe reaction to this drug, the side effects can include: difficulty breathing; swelling of the face, lips and tongue; severe cough; painful urination, unexplained bruising, and stomach cramps. Click here more on this drug. Sophia Gettino’s medical records are published by written authorization by her family.